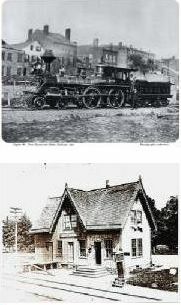 SITE LAST UPDATED: 3/14/2013 8:39 a.m.
We will be speaking at the Naugatuck Historical Society on Sunday, April 14, 2013 at 1:00 p.m. on "The Iron Horse in Naugatuck." The talk, also covering Union City and Allerton Farms, will take place at the 1908 NYNH&H station where NHS is headquartered. Discussion to follow. Click here for the website and directions. All are welcome! "An accident happened on the Railroad between Newington and New Britain stations on Thursday evening. As the express train for New York passed a cross road, it came upon a wagon containing a man and woman. The man was killed instently [sic] and the woman died in a few minutes. Their bodies were carried to the Berlin station. They were James Downes and his sister, (Irish.) The horse attached to the wagon was killed. No blame as far as we learn is attributed to the engineer." The entries above point you to significant additions and changes that result from our ongoing research. These are highlighted in blue on our Track pages for a period of time. With a starting point of 9/2/12, we will leave a 'rev' date note on any entry in which we make a substantive change in the future. Always feel free to contact us for clarification of any details of particular interest. Born on Christmas Day, 2008, TCS has welcomed more than visitors since its inception. It is our intention to present original research of the highest quality, with sources identified and verified as fully as possible. Many of the sources are reflected in the research links below. Primary source material will include railroad commissioners' reports, documents and correspondence, annual reports of the railroads and municipalities, and other first-hand historical accounts. Secondary sources will include local town and county histories as well as newspaper and periodical articles, the latter referencesd in the text or in endnotes as title/month/day/year/page format, e.g. NYT/01/01/1901/01. Photographs, postcards, maps and other visual materials will also be an important source category. We could not possibly have undertaken this challenge with help. Many thanks to the individuals, institutions, and organizations who have made contributions of materials, information, and support to TylerCityStation. Primary among these are the New Haven Railroad Historical and Technical Association, of which we have been a member for almost 40 years, the Connecticut Historical Society, to which we also belong, and the Dodd Research Center at the University of Connecticut. We make every effort to keep in touch with the numerous libraries and historical societies we have visited and whom we consider to be ongoing research partners.